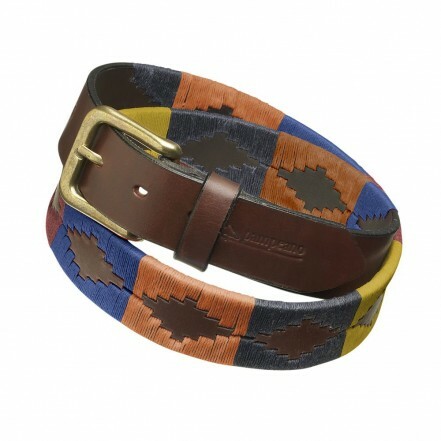 This polo belt has been hand-crafted in South America by highly skilled, traditional artisans, who have been practicing this ancient technique of hand-stitching and leather work for generations. The leather itself is hand-selected locally from the finest pieces which have been naturally vegetable-tanned to produce the most exquisite results. After the natural dyes have nourished each layer of the leather, it is then tumbled in large drums to create the softest, buttery leather that is rich in colour and only improves with age as the leather warms with use. The thick, wax-dipped thread was originally used on Pampeano&apos;s polo equipment and saddlery before being vibrantly coloured to stitch onto belts that polo players would wear with their uniform to display their team or club colours. The waxed coating on the threads help to glide it through the leather during the hand-stitching process whilst keeping the colour vibrant and protected. The smooth, waxed surface also makes the threads easy to clean with just a non-coloured sponge and soapy water. Everything down to the antique brass coloured buckle, is hand-crafted in South America. The iconic tree and horizon logo is blind embossed onto the tongue of the belt as a stamp of authenticity and assurance of exceptional, authentic craftsmanship.